Some specialized labeling machines also exist. These include rotary labeling systems for bottles and special printers and applicators for RFID and security tags. Gettig Labeling System – Elamrk Packaging, Inc.
Labeling machines is a general term that applies to all labeling equipment, be they applicators, dispensers, printers or full fledged labeling systems. They all produce or attach labels to products, be it specialized labels for individualized goods or generalized labels that are mass produced. The weight and price tags at the meat counter at the grocery store are an example of custom labels, while the labels on baby food jars are produced and applied in a factory, one after another and are therefore stock labels that are mass produced. Any industry that manufactures any type of product utilizes label machines, including food and beverage, medical, agricultural, electronics, textile and automotive companies. Labels purchased at the post office, which are printed out and applied to packages, are a major aspect of the shipping and handling industry. Also, any and every store and supplier depends on a specific type of labeling called bar coding. Bar code labelers are encoded tags that allow cashiers to swipe them with an infrared price gun and have the price pop right up. This specific label has simplified the industry and helped make it what it is today. 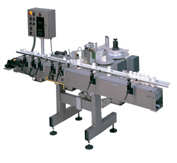 Semi-Automatic Labeling Mechanism – Elamrk Packaging, Inc. The variances in labeling machines are important, since a buyer must understand the different products to know what will suit in what context. Label printers are generally high-quality, fast-working thermal transfer printers. Specialized label printers exist for a variety of applications such as in laboratories and for hospital wristbands. Printer-applicators both print and apply labels for nearly any packaged good. Labels may identify the product and brand specifically or they may have added information such as nutritional facts, product warnings, or bar codes. Label applicators apply labels to individual products. They come in air-blow and tamp-blow varieties that blow labels onto products quickly and accurately. Another type of label applicators is the wipe-on applicator, which wipes labels onto products, including around corners and on curved and unusually shaped products. For more complicated labeling needs, labeling systems can be used. Labeling systems are integrated systems that include label printing and applying, integrated conveyor belts, and computerized controls. Labeling Machines Labeling machines apply labels to various products. The most common types of labeling machines include label printers, label applicators, printer-applicators, and labeling systems.